Marianne Fredrikson, Les filles de Hanna. Marianne Fredriksson (b. 1927) is one of the most prominent authors, not only in Sweden, but also in Europe. Her books have been translated into more than 47 languages and published in great volumes throughout the world. Before she embarked on her life as an author, Marianne Fredriksson had a successful career as a journalist on the newspapers Göteborgs-Tidningen and Svenska Dagbladet. Later on, she became Editor-in-Chief for the magazine Allt i Hemmet (Everything in the Home) and she also launched the successful magazines Vi föräldrar (Us Parents) and Allt om Mat (Everything About Food). She wrote her first book Evas bok (The Book of Eve) while recovering from a mid-life crisis, and in 1988 left her employment at Svenska Dagbladet to devote all her time to writing. 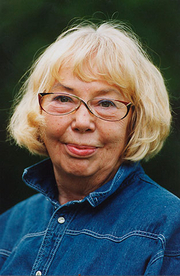 Marianne Fredriksson died very suddenly on 11 February 2007. She wrote and published fourteen novels and a number of non-fiction books during her lifetime - all of which have enjoyed a large readership. Marianne Fredriksson is currently considered a "single author." If one or more works are by a distinct, homonymous authors, go ahead and split the author. Marianne Fredriksson is composed of 12 names. You can examine and separate out names.